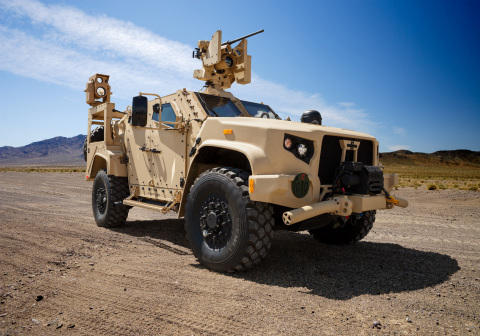 Oshkosh Defense, LLC, an Oshkosh Corporation (NYSE: OSK) company, will showcase two variants of its Joint Light Tactical Vehicle (JLTV) with next generation lethality and networking capabilities at the AUSA Conference 2017. The vehicles will be on display at the Walter E. Washington Convention Center in Washington, D.C. from October 9 -11, 2017. The JLTV Family of Vehicles was designed with room for growth to provide Warfighters with next-generation protected mobility in the light vehicle class, while supporting advanced networking and increased fire power. The JLTV General Purpose vehicle on display in the Oshkosh booth (top photo) is equipped with a Boeing Compact Laser Weapon System (CLWS), a Kongsberg Protector LW 30 Remote Weapon System (RWS) with a M230LF cannon, and a communications suite that includes a Thales VRC-111 and Thales VRC-121 VIPER. The JLTV Utility vehicle on display (middle photo) is equipped with the Boeing Maneuver Short Range Air Defense (SHORAD) Launcher including a M3P .50 cal machine gun, M299 launcher with four Longbow Hellfire missiles, sensor suite, and a communications suite including a Thales VRC-111. A third Oshkosh JLTV, a General Purpose vehicle, will be on the show floor (bottom photo) in the Rafael Advanced Defense Systems booth #1911, showcasing Rafael’s Samson RWS Dual Stabilized Remote Weapon Systems (RWS) with M230 LF, and the Trophy Light Active Protection System (APS). Oshkosh Defense leadership will be available to discuss the Oshkosh JLTV Family of Vehicles, and the Company’s full portfolio of vehicles, technologies, integration capabilities and aftermarket solutions at the AUSA Conference 2017 in booth #6629. Founded in 1917, Oshkosh Corporation is celebrating 100 years of business and making a difference in people’s lives in 2017. Oshkosh is a global leader in designing and manufacturing a broad range of access equipment, commercial, fire & emergency, military and specialty vehicles and vehicle bodies. Oshkosh Corporation manufactures, distributes and services products under the brands of Oshkosh®, JLG®, Pierce®, McNeilus®, Jerr-Dan®, Frontline™, CON-E-CO®, London® and IMT®. Since the Company’s humble beginnings, Oshkosh has grown in size and global footprint. Today, Oshkosh products can be found in more than 150 countries and are recognized around the world for quality, durability and innovation. Oshkosh Corporation is a different integrated global industrial committed to making a difference for customers, shareholders, our communities and the environment. For more information, please visit www.oshkoshcorporation.com.